It would seem Chicken and Guns has been poised on the edge of greatness for a while now. In 2016, it was named Co-Cart of the Year and there were plans to open five brick-and-mortar locations. Uncertainty hangs over the expansion at this point after the cart found itself facing controversy involving food and race, two factors that often come to a boiling point in this city. Apprehensions aside, the staff at the rustic-themed spot in the Cartopia pod were mellow but efficient, turning out a quarter-bird with a side of crunchy potatoes ($9), the "guns," slathered in Peruvian aji—which added a much-needed swath of green—in only a few minutes. The thin layer of char on the skin acts as the perfect shell for the juicy meat underneath with a lemony tang that hits the back of the throat. 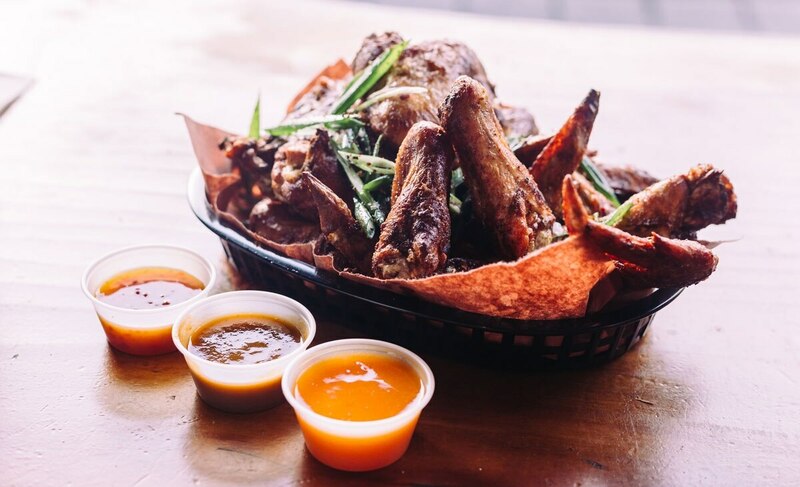 Then there's the wings (six for $10, 12 for $16), which are crispy, juicy and a bit smokier than the larger servings of the bird. The trick to enjoying these is to combine the accompanying sauces—an aji Amarillo chili and earthy, but not-too-spicy, habanero carrot. Pro tip: Don't be cheap, add the sunny egg ($2). The sloppier the better.